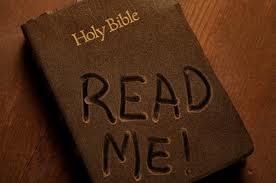 Illiteracy is a huge hinderance on human development, likewise scriptural illiteracy hinders spiritual development. 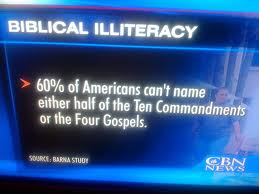 Many Christians are suffering from scriptural illiteracy. They attempt to live a Christian life based on books written about the bible, what people say on Christian radio and TV programs, pastors and friends advice, and posts on Facebook or blogs just like this one. All of these thing have some value but they are only supplements to the real thing: THE BIBLE. We cannot live on supplements alone. We must be intimately familiar with Gods Word. This is the foundation that we build our lives on. 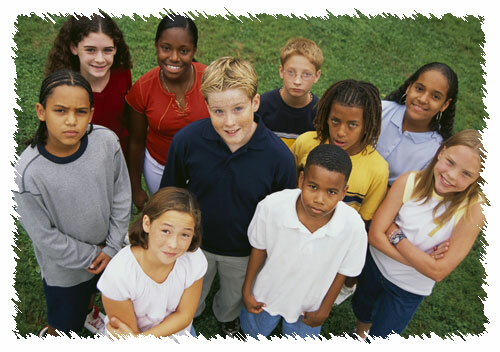 Without this foundation we are incapable of weathering the really tough storms in life. Building a Godly life on the sands of scriptural illiteracy is impossible. Don’t be deceived into thinking that you can live the Christian life and fulfill Gods purpose without the YOU reading YOUR bible. Realize that the bible is God speaking to you. A man told me once: “You must have daily exposure to, and intake of Gods Word.” and you know what? He was Right. Proverbs 4:20-22 ~ 20My son, give attention to my words; Incline your ear to my sayings. 21Do not let them depart from your eyes; Keep them in the midst of your heart; 22For they are life to those who find them, And health to all their flesh. Matthew 10:8 ~ Heal the sick, cleanse the lepers, raise the dead, cast out demons. Freely you have received, freely give. What did Peter have that he was able to give away? The authority of Jesus name. You have been given that same authority. The Chief expression of Love (God) is to give. If you receive a blessing from God, like a healing in your body, and you see a person that needs that same type of healing, YOU have an anointing and a right to freely give that person what you have received. I have seen this done hundreds of times in the last 23 years and just understood this principle this week. There is a ton of scripture that supports this too. MAN, GOD IS GOOD! I was in a time of worship and prayer. I had one of my favorite worship tapes playing and I had been singing to the Lord for about an hour. My devotional time had changed over the last couple of weeks from prayer and reading the Bible to just worshipping Him. Every day God honored me with His presence, and every day that went by, my life seemed to get clearer and less complicated. I began to see everything differently, God, people, myself. There is something about worship that purifies you and puts life into its proper perspective. It’s like getting into a vehicle that takes you into the presence of the Almighty God. In His presence there is a wonderful exchange that takes place, and we always get the better of that exchange. You honor God with your love and devotion, and He transforms you, and you become more like Him. What a powerful thing worship is. Worship is also anther vital life connection which we will discuss in a later chapter. As I was enjoying the sweetness of His presence the tape had ended and I just sat there in a holy silence. The joy that I felt was overwhelming. You can’t worship God for more than a few minutes without it bringing some kind of joy in your life. I wasn’t sure what to do, I really didn’t want to move but I wanted to bless Him, so I said “Lord I love you SO MUCH!” Then I heard this still small voice on the inside, “Jack, how much do you love me?” Without thinking I burst out with my reply, a phrase that we all have used or at least heard. I said “Lord I love you with all of my heart!” The Lord then replied in that same small voice “That’s not enough”. With those words I became very still. It didn’t take my little brain long to do the math on that one. Loving God with all your heart is only one-fourth of what we are commanded to do. 25%! I thought to myself, “that’s pretty weak”. I began to meditate on what it meant to love God with your soul, to love Him with your mind, and to love Him with strength. I had to admit that I really didn’t know what that meant. I was intrigued by this new line of thought, and at the same time, I was appalled to think that those three major areas were either weak or non-existent in my walk with God. I was doing my best to show the Lord how much I loved Him, but my best is only my best until I can do better, I saw areas of my life that I could improve on. God was showing me that I could do better and I realized that I should have been looking for ways to do better all along. From that point I began to take a long hard look at my life and my relationship with God. A relationship that I thought was pretty strong. I knew God was about to redefine my definition of “strong relationship”. The first thing I did was ask God to teach me about His love. He was obviously trying to show me something and I wanted to get everything He was trying to give me. The second thing I did was get a concordance and look up the meaning for the Greek word Love. I thought I knew what it meant but after that kind of correction from God I did not want to take any thing for granted. To know how to love I first needed to make sure that I knew exactly what love was. The word for love that is used in Mark 12:30 is the Greek verb agapeo. agapeo = Love, a verb. “the commitment of devotion that is directed by the will…and can be commanded as a duty”. It has been said that love can only be known by the actions that it prompts. In other words, love gives of itself and expresses itself in action or it is not love. Love is as love does. It’s not enough to just say you love someone, love is active and alive, an aggressive force, to love is to give. 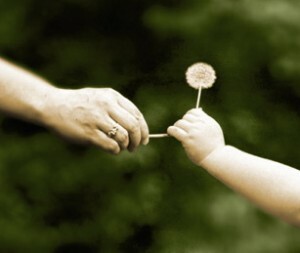 In fact love is the highest and most honorable form of giving, while giving is the chief expression of love. Look at the language that is used in the definition, words like commitment and devotion. If you have ever been committed or devoted to something or someone, you know full well that it takes some effort and some work. Love is tied to your will. We must make a choice to love. By choosing love we have automatically chosen to give something of ourselves. Love is an act of your will, without action it is not love. I come from a faith background and I knew that faith without works is dead according to James 2:26, but I just found out that love without works is dead also. That made perfect sense to me because Faith works by Love according to Galatians 5:6 . I began to see why my faith was not working at the level I knew it could. We have all heard the old phrase “I’m falling in love” but you can’t fall in love, that is just infatuation. To fall into something indicates a mistake or something accidental. Love is far more purposeful than that. It takes concentrated effort and focus. Love is not defined until you have worked at it for a while and invested something in it. There are a lot of Christians today that are merely infatuated with God and they think that they really love Him. In fact if you told these folks that they really don’t love God they would be ready to fight you to defend their position. Those that are infatuated with God are the folks like this: They go to church on Sunday (most of the time) because they don’t want to make the spouse mad or they don‘t want to feel guilty. These people know in their heart that God is real and they may even believe that God has great things for them. Unfortunately they don’t serve Him in the church, they don’t give of their finances and they don’t get involved with supporting the vision of the local church body, not even in prayer. Their bibles are dusty and all they do is play church. They always have an excuse why they can’t get involved in serving somewhere in the church and they will drop a few bucks in the offering plate as it goes by so it looks like they are givers and “doing their part” to those around them. These are the people who haven’t committed or devoted themselves to God. Don’t be discouraged if I have just summarized your Christian life and walk with God. The good news is that it is very easy to move from being infatuated with God to truly loving Him. I have seen many people in my church make this transition as their faith develops. It is a glorious thing to see. It is easy to tell if someone is really in love with God. You can see it in their expressions, their actions, and even the tone of their voice when they mention “The Lord”. As a church in these last days we must make this transition into truly loving God with everything that is in us. No more half-hearted, part-time, milky toast Christianity. There is a world out there that is desperate to see this level of sold out commitment. The greatest witness that we have is our love for God and people. A lot of folks are searching for this and don’t even know it. The saved and lost alike. I have asked the Lord to show me how to Love with the soul, mind and strength and have found that this is revelation that our entire Christian life is built on. Knowing what each aspect of this command looks like can make a huge difference in your life and ministry. How do we overcome? Part of the way we overcome is by our testimony. This is not just limited to the story of how you came to a relationship with Jesus Christ, in fact it is more about what you are TESTIFYING on a DAILY BASIS. Do you testify about your illness and how you never have enough, or are you “calling those things that be not as though they were.” (Like God does … like Abraham did, Romans 4:17 ) and declaring the promises of God in the face of your adversity? 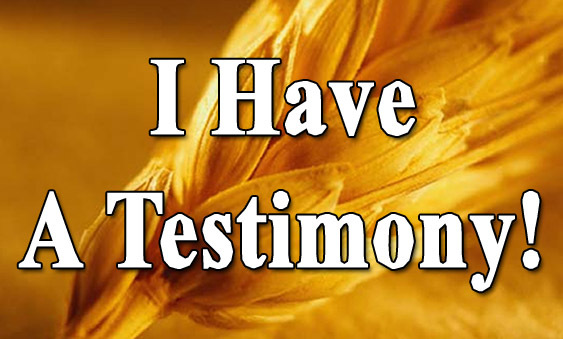 Search this site and find the biblical confessions that address your concerns. They are all organized and printable for your convenience. Begin speaking the promises of God every day and TESTIFY of what God is saying about you. Things are WON in the spirit realm before you see them in the natural realm. Use the Sword of the Spirit and FIGHT for what is rightfully yours! WIN IT IN THE SPIRIT, THEN EXPECT IT IN THE NATURAL! I don’t know how many times I have heard this expression from Christians. Not just from immature Christians, but people I love and respect as being mature in the faith. I feel the need to shed some light on this subject; not as a correction, but to bring solid understanding because it IS a tool the enemy uses to trick us into hurting others and falling into sin. First off, being offended is NOT a sin, so get rid of that thinking. (I will prove this with scripture in a minute.) This line of thought alone will set you up for deception by the enemy and make it easier for him to trick you into getting into pride and unforgiveness. We all get offended at times; in fact Jesus said that it was impossible for offences NOT to come. Luke 17:1-3 ~ 1Then He said to the disciples, “It is impossible that no offenses should come, but woe to him through whom they do come! 2It would be better for him if a millstone were hung around his neck, and he were thrown into the sea, than that he should offend one of these little ones. 3Take heed to yourselves. If your brother sins against you, rebuke him; and if he repents, forgive him. We get offended when someone sins against us. Being offended hurts. It stirs up emotions of anger, sadness and disappointment. If we let those emotions have control, we will move from being offended into sins of pride and unforgiveness. Offence is the temptation, not the sin. By not understanding the temptation we make it easy for the enemy to trip us up. If Jesus said it was impossible that offenses NOT come, then He had to have experienced being offended too because the bible says that He was tempted in every point as we are. touched with the feeling of our infirmities; but was in all points tempted like as we are, yet without sin. Here is an account in Matthew of Jesus getting offended. That’s right, JESUS GOT OFFENDED. It freaks most people out the first time they hear that, nevertheless, here it is. Notice how Jesus deals with it using a strong rebuke as described in Luke 17:3 above. Matthew 16:22-24 ~ 22Then Peter took Him aside and began to rebuke Him, saying, “Far be it from You, Lord; this shall not happen to You!” 23But He turned and said to Peter, “Get behind Me, Satan! You are an offense to Me, for you are not mindful of the things of God, but the things of men.” 24Then Jesus said to His disciples, “If anyone desires to come after Me, let him deny himself, and take up his cross, and follow Me. The big problems that the church faces are that most of her offences are either imagined or people are getting offended because of their pride. When we start rebuking people for an imagined offence, or because we are full of pride, we cause division and strife in the body, hurting more people and scattering more temptation around. The Devil just loves this. Offense is the “bait” to get you into sin. It is a neat trick of the enemy to get the prey to scatter his bait around so he can subdue MORE prey. As a hunter I can really appreciate this tactic and its effectiveness. If someone legitimately sins against you, then the way to deal with it is to rebuke him or her. Let them know that what they did is wrong, that it offends you, and make it clear that is not acceptable behavior. On the other hand, If what they did hurt you and you feel offended, yet you know they did not sin against you, you need to take heed to yourself. (Luke 17:3) Issues of pride are the common cause in this instance. Be aware enough and mature enough to recognize it and repent. It will save relationships and keep you from being a tool of the enemy. Don’t let offense be a stumbling block for you. If you do, Satan will use you to scatter his foul bait around the body of Christ to bring division and strife through you and hurt people. I don’t know about you, but I would rather not help the Devil with his agenda. Posted in Forgiveness, Religious COW Tipping! For those of you who know me, you know that speaking the Word of God is a HUGE deal with me. The reason it is so important, and I put so much emphasis on it, is because I know the impact it has had on my life. I have also seen the difference it makes in people’s lives when they get a hold on biblical confession. These simplified paraphrases of God’s Word can make a lasting positive impression that will help your children be victorious in this life. ENJOY! the One who lifts up my head. my enemies turn back, They shall fall and perish at Your presence. wonderfully made; Marvelous are Your works, And that my soul knows very well. tried in a furnace of earth, Purified seven times. 1 Samuel 2:2 ~ “No one is holy like the LORD, For there is none besides You, Nor is there any rock like our God. 2 Samuel 22:32 ~ “For who is God, except the LORD? deliverer; My God, my strength, in whom I will trust; My shield and the horn of my salvation, my stronghold. Psalm 19:7-9 ~ 7 The law of the LORD is perfect, converting the soul; The testimony of the LORD is sure, making wise the simple; 8 The statutes of the LORD are right, rejoicing the heart; The commandment of the LORD is pure, enlightening the eyes; 9 The fear of the LORD is clean, enduring forever; The judgments of the LORD are true and righteous altogether. Psalm 23 ~ 1 The LORD is my shepherd; I shall not want. will fear no evil; For You are with me; Your rod and Your staff, they comfort me. anoint my head with oil; My cup runs over. Psalm 24:8-10 ~ 8 Who is this King of glory? The LORD strong and mighty, the LORD mighty in battle. 9 Lift up your heads, O you gates! Lift up, you everlasting doors! And the King of glory shall come in. 10 Who is this King of glory? The LORD of hosts, He is the King of glory. Selah. Psalm 25:4-6 ~ 4 Show me Your ways, O LORD; Teach me Your paths. 5 Lead me in Your truth and teach me, for You are the God of my salvation; On You I wait all the day. I fear? The LORD is the strength of my life; Of whom shall I be afraid? trusted in Him, and I am helped; Therefore my heart greatly rejoices, And with my song I will praise Him. afraid; ‘ For YAH, the LORD, is my strength and song; He also has become my salvation. up for those who fear You, Which You have prepared for those who trust in You In the presence of the sons of men! Psalm 34 ~ 1 I will bless the LORD at all times; His praise shall continually be in my mouth. 2 My soul shall make its boast in the LORD; The humble shall hear of it and be glad. fears. 5 They looked to Him and were radiant, And their faces were not ashamed. 6 This poor man cried out, and the LORD heard him, And saved him out of all his troubles. 7 The angel of the LORD encamps all around those who fear Him, And delivers them. 8 Oh, taste and see that the LORD is good; Blessed is the man who trusts in Him! 9 Oh, fear the LORD, you His saints! There is no want to those who fear Him. 10 The young lions lack and suffer hunger; But those who seek the LORD shall not lack any good thing. 11 Come, you children, listen to me; I will teach you the fear of the LORD. 12 Who is the man who desires life, And loves many days, that he may see good? 13 Keep your tongue from evil, And your lips from speaking deceit. 14 Depart from evil and do good; Seek peace and pursue it. trust in Him shall be condemned. information we have, the story of our new birth in Christ. This is my story, friend. Don’t be afraid to share yours. If you tell your story… they will listen. I used to invite people to church. I used to tell them that God loved them. That God was good and that He could change their lives for the better. I told many people the most important decision in their life was to receive Jesus as their Savior and I truly believed it. For years I had witnessed God’s love, power, and salvation. I wanted everybody to experience it. 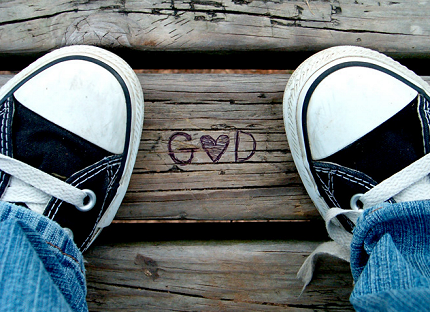 And one good day… I realized that I needed God too! I needed to answer my own invitation. The truth I shared with others was not my own. I knew God through the experiences of others, but had not made Him my Lord and Savior. I knew Him from a distance, but that changed with one simple prayer. I called on the name of the Lord and He saved me, Alleluia! I got on my knees on my livingroom floor and cried out to God and asked Him to be my God. Many years have passed, but receiving Him as my personal Savior has turned out to be the most important decision of my life. I have since experienced the transforming power of His love and salvation in my own life and I can tell you this. Knowing about truth and experiencing the truth are two very different things. I am so happy that I chose the second.